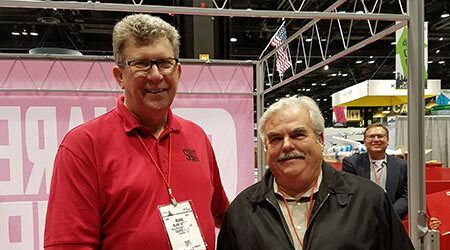 Every year at ISSA/INTERCLEAN, Square Scrub honors the sales representative of the year, as well as the sales representative group of the year. 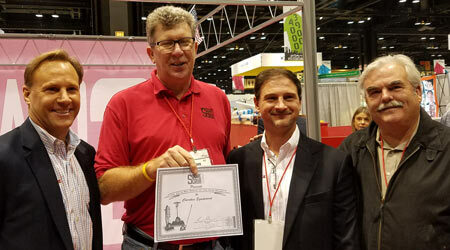 At the ISSA/INTERCLEAN show this year, Square Scrub named Cherokee Equipment as their 2016 Rep Group of the Year. Cherokee Equipment had an increase in sales of over 60 percent, and grew market shares accordingly. Cherokee Equipment focuses on equipment sales and support. They are a very strong presenter when it comes to demonstration of Square Scrub products. Cherokee Equipment recently completed the remodeling of a new state of the art facility in New Jersey. This new facility includes a large floor maintenance demonstration area, where they invite dealers and end users to product training events. Cherokee equipment representatives include Kevin Kleppe, Vince Marchetti, and George Butler. Square Scrub also named George Butler of Cherokee Equipment as their Rep of the Year. George is a proven sales leader, as well as a phenomenal representative for both Square Scrub and Cherokee Equipment. George has proven that hard work and product demonstrations do pay off. Both awards were presented by Square Scrub V.P. of Sales, Mark Wierda.